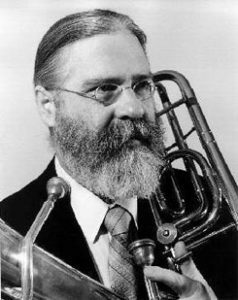 Loren Marsteller was formerly Principal Trombone with the Calgary Philharmonic Orchestra in Alberta, Canada, and a Euphonium soloist with “The President’s Own” United States Marine Band, in Washington, D.C. He is a graduate of the University of Southern California (BM) and the Catholic University of America (MM) where his teachers were his father, Robert Marsteller, principal trombone of the Los Angeles Philharmonic Orchestra, and Keith Brown, trombonist with the Metropolitan Opera Orchestra in New York and the Philadelphia Symphony Orchestra. Mr. Marsteller is an active free-lance musician based in Los Angeles and may be heard on sound tracks as varied as “Star Trek III: The Search for Spock,” “Glory,” “Geronimo: An American Legend,” and recently, “Saving Mr. Banks” where he also made a cameo appearance helping the young P.L. Travers onto the stage. He has recorded on A&M, Avant, Capitol, Columbia, Crystal, Golden Crest, Summit and Virgin labels. Currently a member of the faculty of California State University, Long Beach, he plays Principal Trombone with the California Philharmonic Orchestra , first Euphonium in the Tubadours, Solo Baritone with the Americus Brass Band and is a Kanstul Performing Artist and Clinician. Mr. Marsteller first joined the Red Lodge Music Festival faculty in 1974.